With passion for inspiration and design, Minuet has been defining new boundaries in fashion since 2007. Known for its celebration of creativity, Minuet introduces its unique interpretation of dresses through delicate silhouettes, elegant fabrics, and vibrant stones and trims. The designers at Minuet dedicate themselves to providing the highest quality dresses and exquisite designs for our customers. We specialize in Prom, Homecoming, Evening, Bridal, Bridesmaids, Graduation and Cocktail attire. 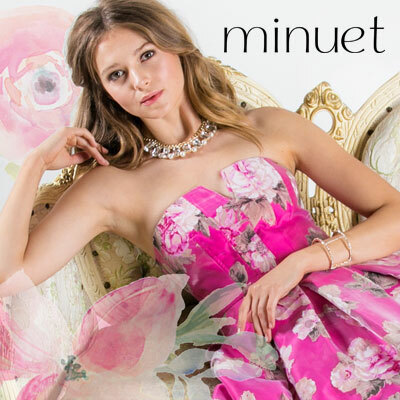 Minuet brand has blossomed into one of the most sought after social dress brand, our line is featured worldwide at specialty boutiques, department stores, and online retailers.